Ignored by passing traffic and lion-clambering tourists, Hubert Le Sueur's Charles I bronze stares blankly down Whitehall to his place of execution. The French sculptor's 1633 piece has been in the same position since 1676, surviving well over 300 years of tinkering transport planners, pesky pigeons and plinth pimping. The statue sits on an irregular traffic island to the south of the square, before the sharper-than-expected incline down into Whitehall. 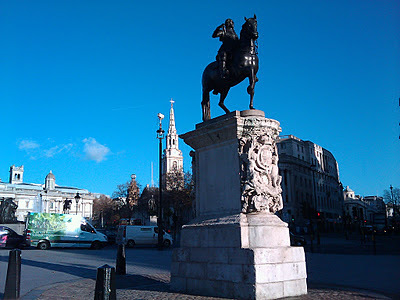 In the picture below you can make out the National Gallery at the north edge of the square, with St Martin in the Fields church to the north-east and the Strand to the right of the sculpture. "... a Horsse in Brasse bigger then a greate Horsse by a foot, and the figure of his Maj King Charles proportionable full six foot, Which the afore saide Hubert le sueur is to performe with all the skill and Workmanship as leith in his powoer ..."
The tourists to the right paused to take some snaps! £100 on delivery of the statue to the Weston's garden in Roehampton. The total sum of £600 would be worth over £50,000 in today's money. A metal plate under the left forefoot dates the completed work at 1633, but was never delivered to Weston (by then the Earl of Portland), who died in 1635. It had not been erected by the breakout of the English Civil War and during the conflict was was stored in the crypt of St Paul's. 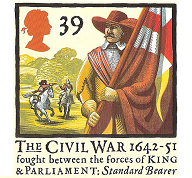 In 1655 it was sold by parliament to John Rivett, a Holborn brazier, with the request that he break it up. 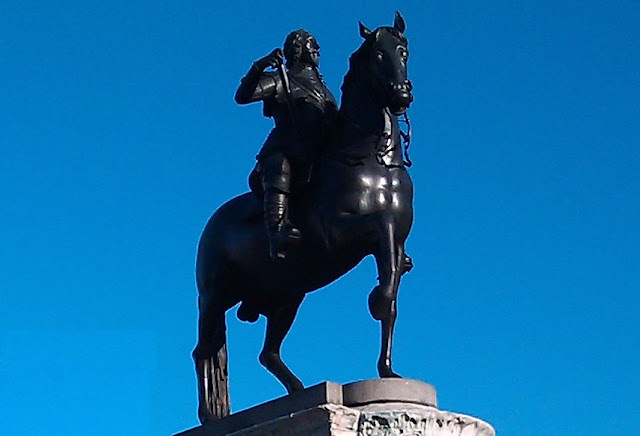 Evidently hiding Royalist sympathies (or with one eye on his pension), Rivett produced some scraps of brass to prove he had done as instructed, while hiding the statue (which can't have been the easiest of tasks). "That the said John Rivett shall permit and suffer the Sheriff of London to serve a Replevin upon the said Statue and Horse of Brass, that are now in his Custody." The west side of the sculpture, with Northumberland Avenue in the background. 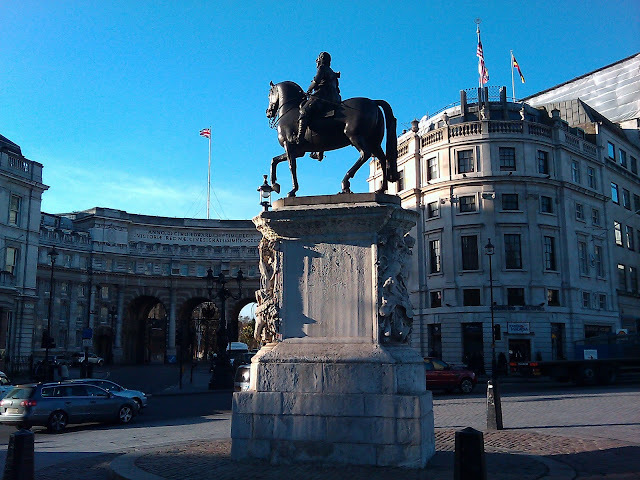 The statue was bought by Charles II and an order given "the effigies of the old King to be brought to Charing Cross and a place made for it." A ledger exists for 1676 detailing all the works carried out to put the statue on its pedestal, amounting to £689 - more than the fee originally paid to Le Sueur. 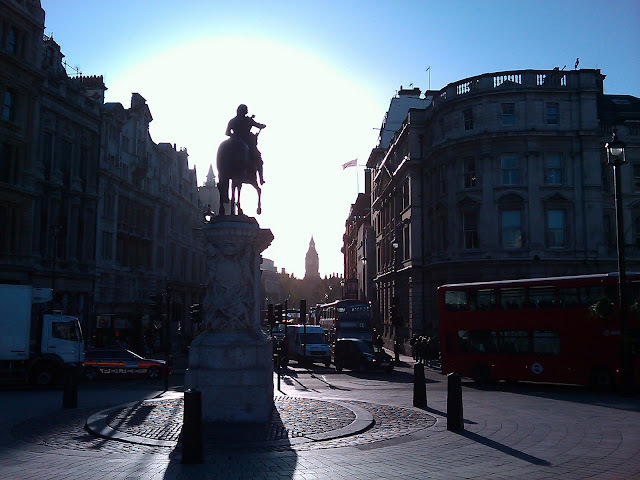 It was placed on the site of the Eleanor Cross, which was destroyed by parliament in 1647. The pedestal has been replaced and repaired a number of times over the intervening centuries, and the current one is severely weather-worn, with the Stuart coat of arms to the rear being almost unrecognisable. 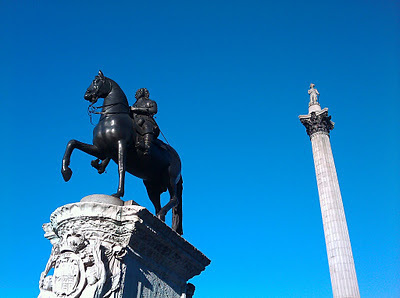 "The sword, buckles and straps, fell from the equestrian statue of King Charles the First at Charing Cross. They were picked up by a porter of the name of Moxam, at the Golden Cross, and deposited in the care of Mr Eyre, trunk-maker, who has apprised the Board of Green Cloth of the circumstance." In the spirit of Mr Rivett, the trunk-maker also refused to give up his piece of the statue, and kept hold of it until given a receipt from the Office of Works. The sword was finally stolen for good in 1844 during Queen Victoria's visit to open the Royal Exchange, and had not been replaced at the time of these photos from the 1930s. 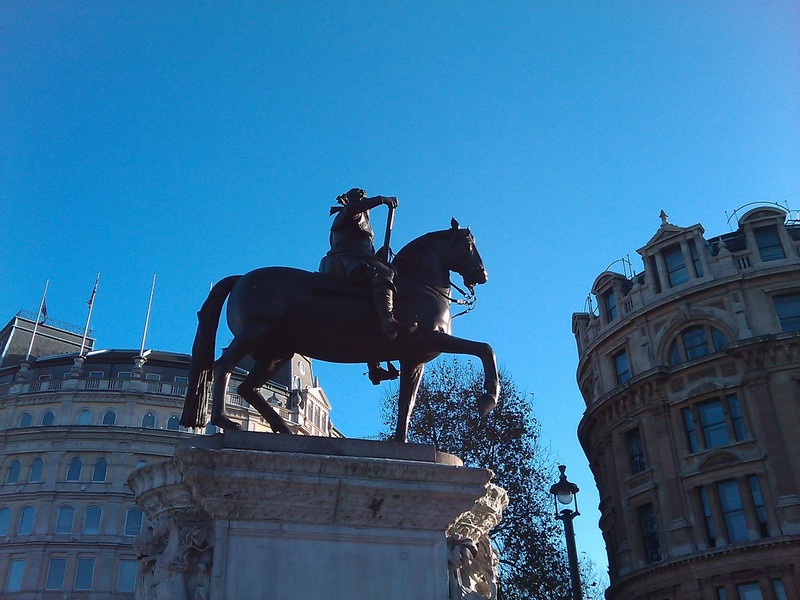 The statue was removed during the war for safety, and a new sword and Order of the Garter added in 1946. Further details on its care and maintenance can be found in the National Archives 'Your Archives' website, in the entry for Le Sueur. And kings so kill'd rise conquerors again. Loud as the trumpet of surviving Fame. The 'martyrdom' is commemorated each year in a wreath laying ceremony at the statue on January 30th, the date of the king's execution. 'The statue of Charles I and site of the Charing Cross', Survey of London: volume 16: St Martin-in-the-Fields I: Charing Cross (1935), pp. 258-268. You picked a good day for the photographs. Quite easy to miss at the bottom of the square. 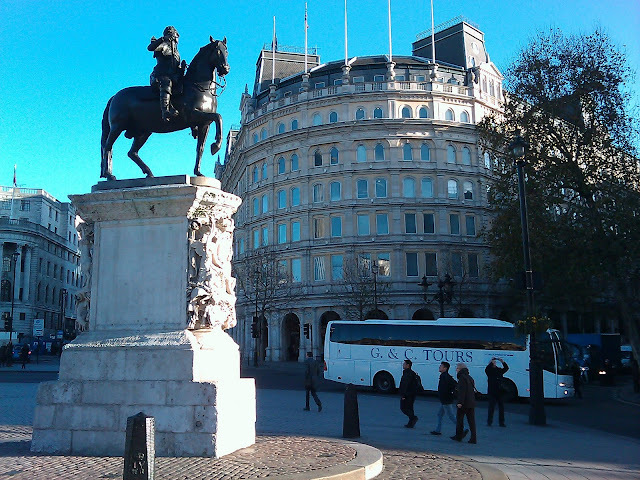 I have walked past it many times without realising it was there..
On first glance you wouldn't recognise it as Charles I... theres always an interesting story with history!